It happens all year long. Christmas may be the most stressful, heartburn inducing, frustrating, guilt-laden time of the year for it. Gift giving. Or, more appropriately, gift selection angst. What to get for the loved one, friend, co-worker when the occasion arises? Funny, how when that time comes the mind goes blank. It’s likely because of the information overload to which we’re all subject. And, guys, I know it can be a seemingly unsolvable mystery, this gift thing. 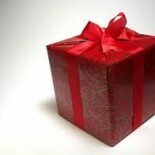 Gift giving isn’t about putting ourselves in a bind or only making an impression. The gesture is about finding the most perfect gift, the one that resonates. That has less to do with size than personality. There are many great gifts out there for $50 or less, whether it’s a bargain price, a sale or clearance. And we’ll tip you about lots of them here. Most of us can use these kind of tips as the economy recovers. Also look for the upcoming Frugalista Gift Guide that categorizes and lists gifts to fit specific recipients. If a product featured here is out of stock, do make use of the retailers product alerts. They’ll send you an email as soon as the product is back in stock. For instance, I found a great potential gift called Salts of the World, but it was out of stock. In about a week, the retailer notified me that it was in and I purchased it in time to present a gift that my cooking relative loved. She’s a cooking fiend, who loves flavor and experimenting. Still, she might never have thought to look for something like this. But she And she would never have known how Lava Salt from Cypress adds pow to her greens. Not without the Frugalista Guide suggestion. And the purchase kept me within budget. A win all around. This entry was posted on March 22, 2012 by frugalistagiftguide in tips, Uncategorized and tagged bargains, gift giving, gifts, shopping, tips.